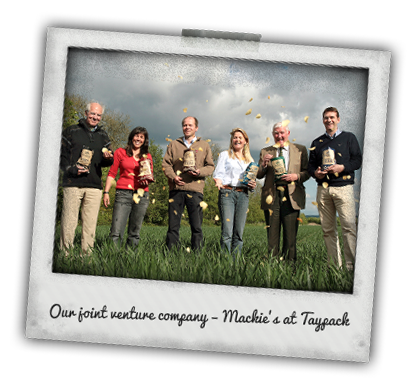 The Mackie’s Crisps story goes back many years… to when the Taylor family began farming in Perthshire in 1927, to them teaming up with Mackie’s of Scotland in 2009, and beyond. 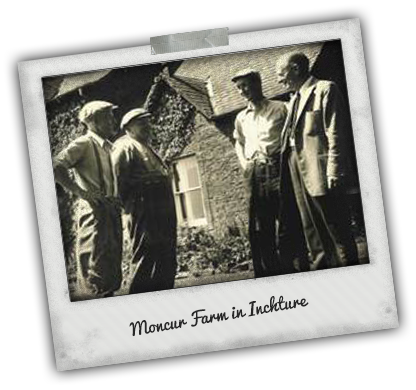 It was way back in 1927 that the late George Taylor began farming in Perthshire, having bought Moncur Farm in Inchture. Who’d have known this would end up being the Headquarters of a flourishing crisps business? Mr Taylor’s grandson – also called George and now the MD of our company – entered the family business and set up Taypack Potatoes, which grew to be one of Scotland’s largest potato businesses. 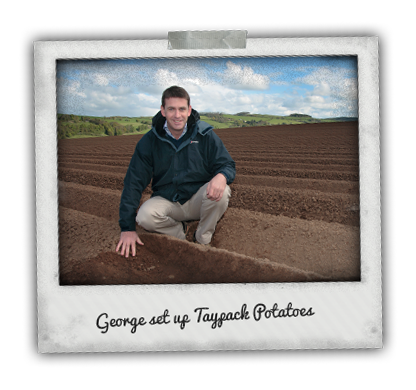 In 2008, the Taylor family secured the sale of Taypack Potatoes and set their sights on the snacking sector. 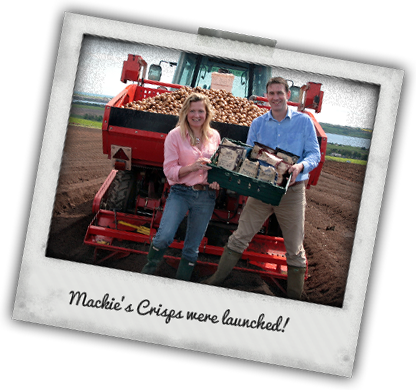 In 2009 Mackie’s Crisps were launched! We began with just three core flavours – Sea Salt, Sea Salt & Vinegar and Mature Cheddar & Onion – but soon added our Scottish speciality varieties to the range. We quickly became renowned for our unique Scottish flavours. Having secured listings with all the major retailers in Scotland, we soon decided to take our crisps further afield. We began to initiate activity in international markets in 2010, including Europe, UAE and Asia. 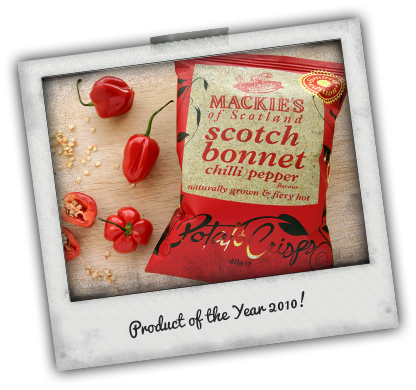 2010 also saw us receive our first Scotland Food & Drink Excellence Award: our Scotch Bonnet Chilli Pepper potato crisps won Product of the Year. In 2011 we launched our Crispy Bacon flavoured potato crisps. We also won another Scotland Food & Drink Excellence Award in 2011, this time in the ‘Retail – Confectionary & Snacking’ category. Furthermore, we won a Great Taste Gold Award for our range. We invested heavily in New Product Development and international activity in 2012. It was in this year that our Honey & Mustard flavoured crisps were launched. 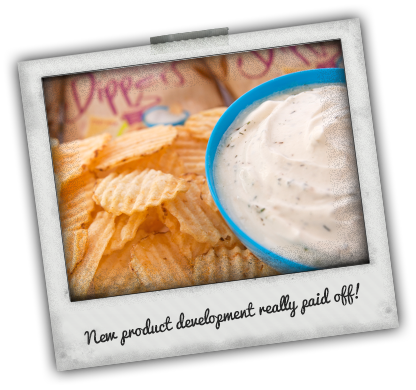 We also created our first ever ‘ridge cut’ crisp, called Dippers, which came with a sachet of dip mix inside the pack. Another exciting launch in 2012 was our multi-packs – we created two different variety packs, each containing five 30g packs of crisps. We continued to grow our export business and, for the second year in a row, we won the Scotland Food & Drink Award for the ‘Retail – Confectionary & Snacking’ category. Following enormous growth in both the UK and overseas we made the decision to move to a larger factory in 2013. 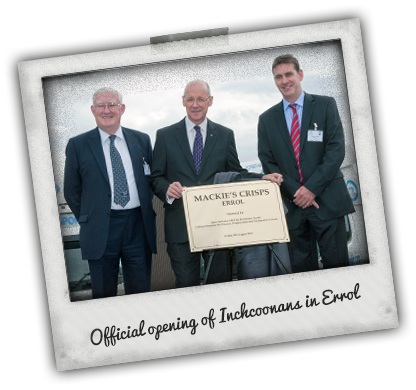 Inchcoonans in Errol – previously Errol Brickworks – was selected as the perfect site to expand our operations. We moved into the new factory in July 2013. Another huge development in this year was Asda’s launch of our crisps in 70 of its stores in England and Northern Ireland – in addition to its 50 stores in Scotland already stocking Mackie’s Crisps. We also launched five new products in 2013; these included our four Ridge Cut varieties and our new Tangy Tomato flavour as part of our Traditional range. 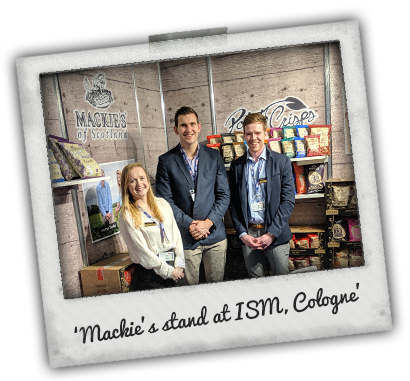 2014 was a particularly busy year for us, with Mackie's crisps spreading far and wide, the launch of new products, and all our hard work being paid off with another award! The aforementioned award was the Scotland Food & Drink Retail Product of the Year Award in the Confectionery and Snacking category for our range of Ridge Cut Potato Crisps. 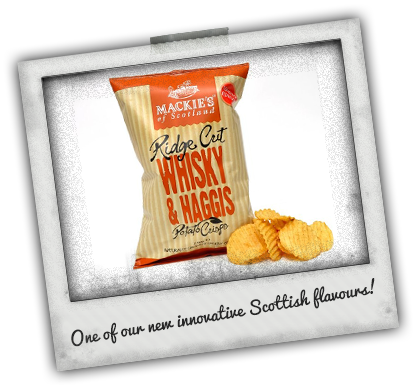 Within this range we launched two new exciting Scottish inspired flavours: Venison & Cranberry and Whisky & Haggis Ridge Cut Crisps. 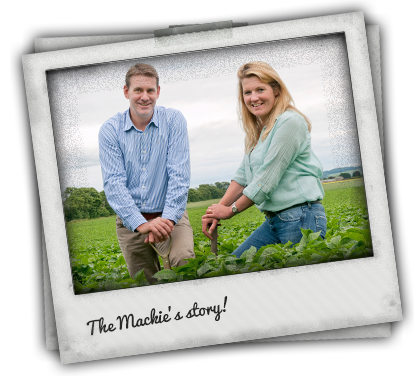 Another new venture this year was Mackie’s Fresh Potatoes, four different varieties of tatties available in 50 Tesco stores across Scotland. Our national listing with Asda was extended to bring our crisps to an additional 124 stores in England, Wales and NI. 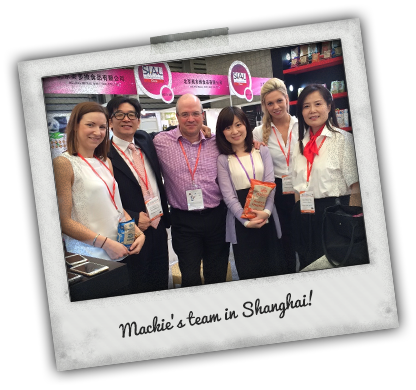 A little bit further afield was our exciting launch of Mackie's Crisps into China! We continued to expand as a business in 2015, with even more flavours, growing sales around the world and getting some brand new equipment at our factory in Errol. Our sales in China have continued to grow rapidly, becoming our largest and fastest growing export market. As a result of this we attended the SIAL show in Shanghai to support our distributors. We were honoured to be announced as one of the UK’s Rising ’50 Food Stars’ in a new government initiative, listing us as one of Britain's 50 most promising food and drink entrepreneurs. An addition to our award winning Ridge Cut Crisps came in the form of a Lightly Salted crisp. Another development at Mackie's was a new piece of equipment in our factory - a conveyor belt installed to make our packing much more efficient. We started 2016 off with a bang, with the launch of our brand new Popcorn range! 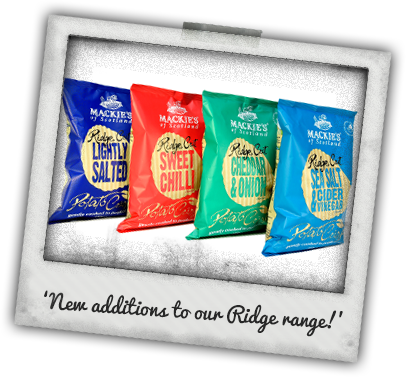 The new products kept on coming with a revamp of our Ridge Cut range into new packaging and an addition of 3 new flavours. These were soon joined by festive flavoured Turkey & Haggis Stuffing Crisps and Mince Pie Popcorn in this jam-packed year of product development. Our export markets continued to develop, seeing us in a whopping 19 countries at the end of the year – our most recent being Russia and the Czech Republic. Sales in China also kept rising, aided by the new Chinese-specific packaging we invested in for this market. Finally, we were delighted to move up one place in the Top 50 Scottish Take Home Brands survey, moving from 10th to 9th after the likes of Malcolm Allan Butchers and Tunnock’s. Here’s to another busy year in 2017! During 2017 two new flavours were brought into our popcorn line up – Sweet & Toffee coated. We also released new festive Pigs in Blankets flavoured crisps for Christmas. 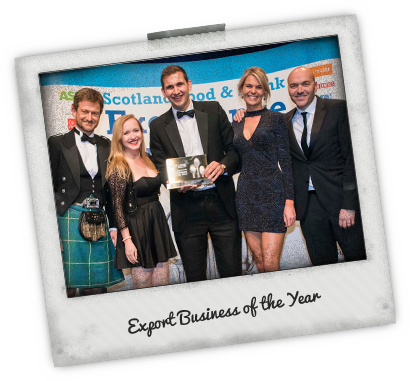 In May of 2017 we took home the Export Business of the Year prize from the Scotland Food & Drink Excellence Awards, with us now exporting our crisps to a total of 25 countries. 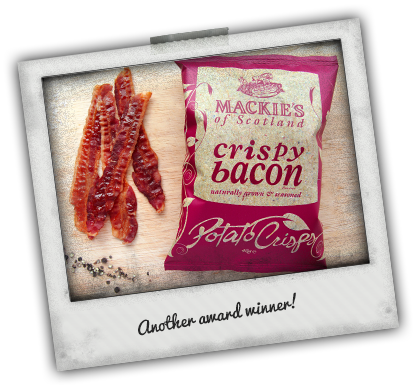 Continued success in the Chinese market prompted us to bring out two sweet flavoured crisps - Strawberry & Salted Caramel, a Mackie’s first! The year also came to a close with another award for International Growth at the Herald Scottish Family Business Awards in December. Our show calendar was as busy as ever, with us attending the Royal Highland Show and Good Food Show Scotland close to home, as well as our first vending exhibition. We also opened our very own factory shop which has proven a hit with locals in the area. We were thrilled to finish up the year by gaining a new listing with online supermarket Ocado, fulfilling the high demand for our products South of the border. 2018 saw us announce our first ever charity partner, Muscular Dystrophy UK, who we raised a fantastic £11,000 for over the year with your help. New products came in the form of our Sausage & Caramelised Onion crisps as well as a new festive Gingerbread flavour toffee popcorn. We were delighted to make our debut at the BBC Good Food Show Summer in Birmingham as well as travelling further afield to attend trade shows in Paris & Cologne. Around the world our crisps continued to grow in popularity, with Japan jumping into first place as our new biggest export market. We ended the year by launching a new brand into the Taypack portfolio – Wholesums, which are whole vegetable popped chips.